Unusual style and grace characterize the beautiful street outfit here portrayed. Black velvet, light-gray cloth, and black silk were associated in the present development of the mode, with bands of gray Astrakhan for trimming. Gray silk frogs and loops affect the closing of the double-breasted coat, which is short at the sides and back and in pointed outline in front. The outfit is designed to produce the long effect from shoulder to bust, and the high flare collar meets the ends of the broad revers. The two-seam sleeves are in scalloped outline at the wrist, and the coat shows the fashionable long shouldered effect. The five-gored over-skirt individualizes the skirt, which is also in five-gored style with a short sweep. The bottom of the over-skirt is shaped in points, revealing a deep knife-plaiting, and there is an inverted box-plait at the back. The dip at the top in front may be either decided or conventional. This attractive outfit would be extremely pleasing made of hunter's green cloth, with silk in the same shade for the knife-plaiting and bands of the green-and-gold braid to give the decorative touches. Two shades of brown would be useful with bands of sable or beaver to trim. The coat pattern, which is No. 4497 and costs 9d. or 20 cents, is in eight sizes for ladies from thirty to forty-four inches, bust measure, and is shown differently developed on page 600. The skirt pattern, which is No. 4451 and costs 1s. or 25 cents, is in seven sizes from twenty to thirty-two inches, waist measure. On page 600, and in figure No. 194 T and on the first cover page illustrations of this coat are given. The garment in the present instance is shown in two developments, Astrakhan cloth being employed in one case and velvet and fur in the other. The coat, which is quite short and closely adjusted at the back and sides, introduces the military shoulders and the dip effect in front. The semi-fitted, double-breasted fronts shape a point at the lower edge and close with cord loops and olive buttons, but may be worn open, if liked; they are turned back at the top in wide levers. A flaring sectional collar is at the neck, and the close-fitting two-seam sleeve may be finished plainly or fancifully at the wrist. Cloth, Cheviot, Melton in medium weight, vicuna, etc., are used for coats like this. A very handsome jacket might be of Persian lamb or seal-skin with facings of chinchilla fur. A lining of silk or satin is always added to coats of this description. We have pattern No. 4497 in eight sizes for ladies from thirty to forty-four incites, bust measure. For a lady of medium size, the coat requires a yard and five-eighths of goods fifty-four inches wide. Price of pattern, 9d. or 20 cents. 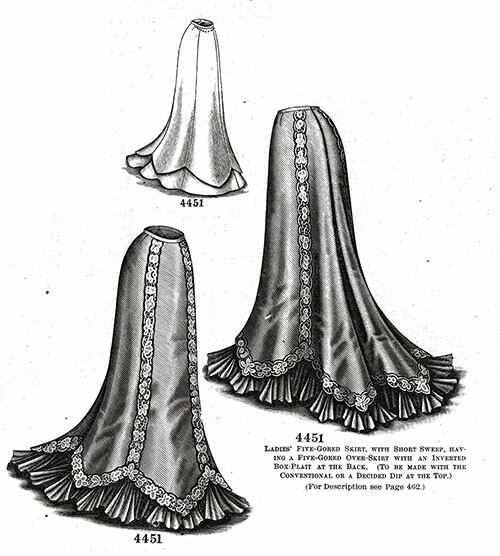 Ladies’ Five-Gored Skirt, with Five-Gored Over-Skirt. Skirt may be seen differently made up by referring to figure No. 162 T in this number of The Delineator. India silk was selected for the development of the skirt in this instance, with lace appliqu6 and plaiting of the silk for decoration. An over-skirt is the distinguishing feature of the design. It is in five-gored style, like the skirt, and is smoothly fitted over the hips by a dart at each side, and at the back is laid in an inverted box-plait. The overskirt has a fancy pointed outline at the bottom and is short enough to reveal a silk plaiting arranged about the foot of the skirt. At the top, the skirt is smoothly fitted by a dart at each side, and the fulness at the back is collected in gathers. The mode is in sweep length and is characterized by the fashionable dip at the top in front, and at the lower edge, in the medium sizes, measures about three yards and a half. A beautiful skirt for dressy wear could be developed in crimson crepe de Chine decorated with Persian bands, and the plaiting could be of the material. Other appropriate materials for the development are Henrietta, cashmere, nun’s-vailing, albatross, Lansdowne, voile, taffeta, satin, etc., and spangled or jeweled bands, ribbon, lace insertion, or folds might be employed for decoration. Wo have pattern No. 4461 in seven sizes for ladies from twenty to thirty-two inches waist, or thirty-seven to fifty-two and one-half inches hip measure. To make the skirt for a lady of twenty-four inches waist or forty-one inches hip measure requires six yards and three-fourths of material twenty inches wide, with five yards and a fourth of silk twenty inches wide for a plaiting (nine inches deep). Two yards and one-fourth of fabric twenty inches wide, extra, will be needed to face the gores when the plaiting is not used. Price of pattern, Is. or 26 cents. A blouse coat that will be found exceptionally becoming for tall, slender figures and an extremely modish skirt are presented at this figure. Broadtail was selected for the jacket, with Astrakhan for the collar, revers and cuffs, and a stitched cloth belt fastened with a dull gold buckle encircles the waist. The coat, which is fashionably known as the St. Petersburg blouse, is exceptionally stylish and shows the fronts turned back all the way in reverse. It introduces the popular dip and is made with a fancy peplum. The full sleeves finished with round cuffs, and flare collar, are becoming features. 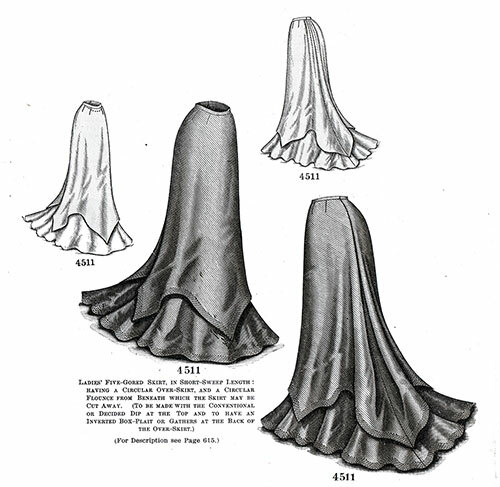 An unusually graceful over-skirt of circular shaping and in pointed outline at the bottom and a circular flounce is a unique feature in the five-gored skirt, which is made with a short sweep. The fullness at the back of the over-skirt may he secured in gathers or inverted box-plait, and the dip at the top in front may either be decided or conventional. A dark-gray mixed tweed was here employed to develop the skirt, with stitched bands of the material for a decorative finish. Smooth-faced Venetian, broadcloth, and light-weight Vicuna in black, automobile-red, royal or pastel blue and mode would be handsome for the development of the skirt, and velvet, velour, etc., for the coat. The coat pattern, which is No. 4521 and costs 9d. or 20 cents, is in seven sizes for ladies from thirty to forty-two inches, bust measure, and is again portrayed on page 602. The skirt pattern, which is No. 4511 and costs 1s. or 25 cents, is in seven sizes from twenty to thirty-two inches, waist measure, and is also pictured on page 610. Illustrations of this coat are given on page 602, and also in figures Nos. 195T and 208T in this magazine. Decidedly becoming and trim is the coat, which is known as the St. Petersburg blouse and is depicted made of black velour with black satin showing rows of stitching for the belt. 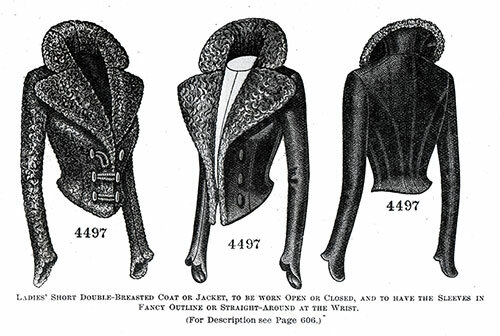 The long effect from shoulder to bust and also the military shoulders are pronounced features of the mode, the back, and sides of which are smoothly adjusted, while the fronts, which are fitted by a dart at the top and gathers at the waist-line, puff out attractively in blouse fashion. 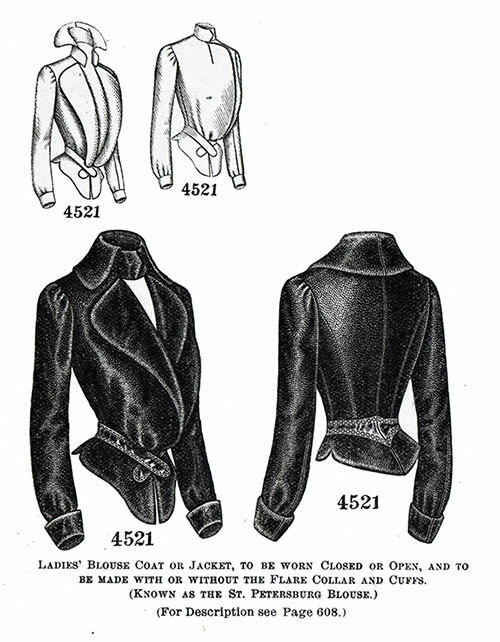 The fronts may be reversed and worn open or lapped in double-breasted fashion and closed to the bust or throat, and a peplum lengthens the coat in fancy outline at the lower edge. The dip outline is emphasized by a belt that has its rounding ends crossed and is in girdle fashion at the back. The deep flare collar, which is mounted on a standing portion in military band style with overlapping ends, may roll slightly or be turned down all around. The comfortably loose sleeves have slight fullness at the top and are gathered at the wrist where they are completed with turn-back cuffs mounted on straight bands; the outside seam ends at the elbow, and a lining supports the sleeve. The cuff, as well as the flared collar, may be omitted. In black or brown velvet decorated with tinsel braid or heavy lace applique, the coat will be very dressy. The revere could be faced with tinsel cloth or rich silk or satin and the edges followed with chinchilla or ermine. A luxurious coat for theatre wear is of gray velvet, with white peau de soie for the lining and revers facing; a beautiful jeweled belt is worn, giving a brilliant touch to the whole. We have pattern No. 4521 in seven sizes for ladies from thirty to forty-two inches, bust measure. To make the coat for a lady of medium size requires three yards and three-eighths of fabric thirty inches wide, with five-eighths of a yard of satin twenty inches wide for the belt. No. 4511 Ladies’ Five-Gored Skirt, in Short-Sweep Length: having a Circular Over-Skirt, and a Circular Flounce from Beneath which the Skirt may be Cut Away. To be made with the Conventional or Decided Dip at the Top and to have an Inverted Box-Plait or Gathers at the Back of the Over-Skirt. For Description see Page 615. This skirt is represented on page 610, and in figure No. 195 T.
A circular over-skirt and flounce are the salient features of the mode, which is in short-sweep length and illustrated developed in fawn cloth and finished with stitching. The skirt is in five-gored style smoothly adjusted with hip darts and has gathered fulness at the back. The flounce is quite deep and is applied at the bottom of the design, which may extend beneath the frill or be cut away, as preferred. The over-skirt is smoothly adjusted over the hips by short darts, and the fulness at the back may be laid in an inverted box-plait or collected in gathers, according to individual preference. The over-skirt flares stylishly at the bottom in deep points over the flounce, which measures about four yards at the foot in the medium sizes. The pattern provides for either the conventional or a decided dip at the top, and the width of the skirt at the bottom is about three yards. We have pattern No. 4511 in seven sizes for ladies from twenty to thirty-two inches waist, or thirty-seven to fifty-two and one-half inches hip measure. 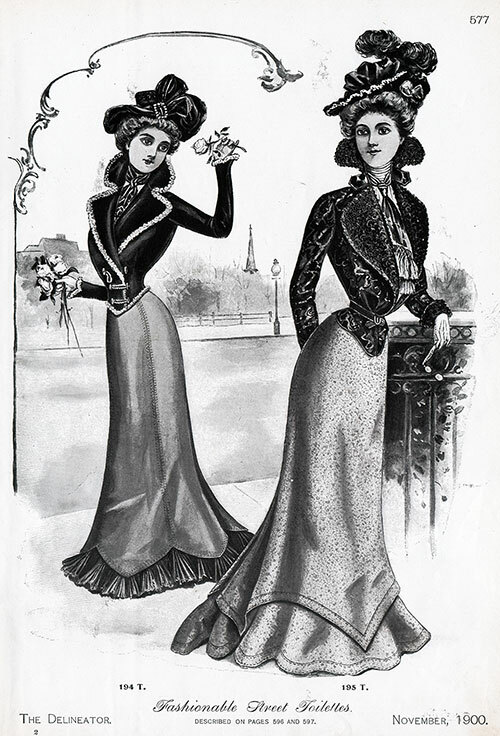 For a lady of twenty-four inches waist or forty-one inches hip, the skirt requires three yards and one-fourth of material fifty-eight inches wide. Price of pattern, 1s. or 25 cents. “Descriptions of Figures in Colors, Tints, Etc., Shown on First Page of Cover and Pages 571 to 591 Inclusive,” in The Delineator: An Illustrated Magazine of Literature and Fashion, Paris-London-New York-Toronto: The Butterick Publishing Co. Ltd., Vol. LXI, No. 5, November 1900, p. 577, 600, 602, 606-608, 610, 615-616. Editor’s Note: Some terminology used in the description of women's clothing during the 1800s and early 1900s has been changed to reflect more modern terms. For example, a women's "Toilette" -- a form of costume or outfit has an entirely different common meaning in the 21st century. Typical terms applied to "toilette" include outfit, ensemble, or costume, depending on context. Note: We have edited this text to correct grammatical errors and improve word choice to clarify the article for today’s readers. Changes made are typically minor, and we often left passive text “as is.” Those who need to quote the article directly should verify any changes by reviewing the original material. Visit our GG Archives Vintage Fashions Facebook Page for the Latest News About the Activities of the Archives.